Payroll processing has always been tough for small business owners as it is prone to errors due to complexity but every small business has to process payroll for employees. In this post we will help you find the best payroll software for small business and best payroll processing service. According to the 2018 Small Business Taxation Survey, one in-three small businesses report spending more than 40 hours each year on federal taxes and 63% of small businesses in the United States spent more than $1,000 each year on the administration alone of federal taxes. The majority of small-business owners say federal taxes have a significant to moderate impact on the day-to-day operation of their business. One-in-three small-business owners spend more than $500 each month on payroll processing services, and among those small businesses that do collect sales taxes, one-in-three report spending upwards of one full work week each year. If you are one of those small business owners in the United States that spends hours in managing and processing payroll then you should know that there are tons of payroll software available out there to simplify the process from time tracking and pay computation to direct deposits and tax filing. All you’ll need to do is choose payroll software for small business that can meet the needs of your company without being heavy on your pocket. If you are finding yourself lost in the Payroll mystery then trying to process payroll even for just one employee can put you in unnecessary penalties by the IRS. There’s a lot to know, and keeping up with many federal, state, and local payroll tax regulations can be a burden difficult to manage. In addition, you have deadlines to meet, for payments and reports to all these agencies. What is a Payroll Software and Payroll processing Service? What is the cost of Online Payroll processing for Small Business? What a full-service Payroll Software for small business must include? Some Important Questions to Ask before purchasing a Payroll Software for Small Business? Gusto, Sage50 CLOUD, Xero, ADP, Intuit QuickBooks Payroll etc. As far as the payroll processing services are concerned, there are two kinds of payroll services, online services and personal services. The online services are apps, web applications or online-based services for processing payrooll. The personal services are a businesses owned by an individual who may do payroll processing online or who may be local. The evaluation process works the same way for both types of payroll services as well for the Payroll software. However, in the post you will discover more about Payroll software for small business. The first question business owners have in mind when looking for a payroll processing service is: ‘How much does it cost?’ While cost is important, other factors are just as important. You must always Consider the cost of the payroll service now and into the future as your need would grow. Suppose you have a very small business with only one or two employees, you may want to limit your cost by using a payroll service with minimal costs for only a few employees and which increases as you add employees and services. For most of the payroll processing services online we looked at the per month cost model so you can change at any time. For most of the services the cost is based on the number of employees. Some offer a 1099 option as well for paying contractors, vendors, or freelancers. Costs come in two levels for some of the services: a basic service that just calculates and delivers paychecks, with maybe a W-2 service, and a full-service option that also does the depositing and paying of payroll taxes and tax filings, including Form 941 which is the quarterly payroll tax reporting form. With so much to do, you can understand why so many small businesses choose a Payroll Software to accelerate payroll processing. By having a payroll software at your disposal, you can simplify and automate the process of paying your employees. From computing deductions and employee benefits to producing payslips and filing employment taxes, online payroll processing services will allow you to reduce cycle times while ensuring calculation accuracy. An ideal payroll software is easy to set up and run. You should have a dashboard to guide you through processes and to allow you to check on activities like filings and paycheck deposits. Must provide an extensive knowledge base and tutorial videos to help you work through the various complex processes. Since, most small business owners have little knowledge, so a best payroll software for small business should provide detailed basic knowledge of payroll terms, paychecks, and filings. Your service should provide you with W-2 forms, the annual employee wage and tax information form you must give to employees in January. The full-service option should also file these forms with the Social Security Administration for you at the appropriate time. Each of these systems allows you to input the information for each employee, including W-4 form for federal income tax withholding and other information needed to prepare paychecks. Systems should let you write printed checks or to have checks direct deposited (the best way). Check with your bank on its requirements. Depositing taxes is probably the most important task. Having someone file and pay these taxes is a big responsibility. A full-service payroll software should file all relevant payroll tax and employment tax documents for you. It should make payments on your behalf with the appropriate federal, state, and local regulatory agencies. Forms should include Form 941 Quarterly Wage and Tax Statement and federal and state unemployment tax forms. The software should also keep track of state and local payroll taxes, which is a great help if you have distributed employees working in different cities and states. Tax Filing guarantees: An ideal payroll software should guarantee that tax forms will be sent before all deadlines and that payments will be made on time so you don’t incur fines or penalties. A good payroll software protects you against any fines or penalties for late filing or payment. Employee self-service Dashboard: A payroll software must include a dashboard that employees can log in to and get information on their year-to-date paychecks. They might be able to change W-4 information from the dashboard. Mobile Device Compatibility: You should be able to access the dashboard and make changes, send in information on your computer, mobile phone or tablet, or even call in information. Easy to Integrate with your accounting system: A robust payroll software integrates seamlessly with most of the accounting systems saving you time and money. For example you can easily integrate XERO payroll with Quickbooks and Intuit Payroll is only sold with QuickBooks Online, so this might ease up things on your side if you already use QuickBooks online. According to “thebalancesmb”, there are several important questions that you must ask before buying a payroll software for your company. Support and service: This one is really important. Things happen and payrolls must be run at specific times. You need to know that your service is available and helpful. The highest level of service: a phone call. What hours does the help desk have? The second-highest level: a chat. What are their hours? The third level: an email. How quickly does your payroll service respond to emails? During the trial period or the first 30 days, make sure you make contact several times to evaluate the support provided. Updates: Payroll tax regulations and tax rates are always changing. As you evaluate systems, ask how they update their software and how they communicate these updates to you. Security: How secure is their system? Is it in the cloud (probably)? How often do they back up? 1099 Service: Some of these systems have an add-on (for extra cost) that allows you to pay contract workers, vendors, and freelancers and issue 1099-MISC forms to them (similar to W-2 forms for employees). The service should also provide filing of 1099-MISC forms with the IRS. Backup withholding: If you are paying non-employees, you may need to have backup withholding taken from their payments. If you have the 1099 service, your service should be able to do this and issue reports. Also, when you have narrowed down to a few payroll processing service providers out of hundreds on the market you must check with the Better Business Bureau to figure out if there are any complaints that have been filed against these companies and whether have been resolved or not? After so many details and discussion about the payroll software, let’s find out which is the best payroll software for small business? In our efforts to find the best payroll software for small business we have emphasized on each platform’s usability, unique features, as well as the inclusions of their subscription packages so that you get a better idea of which one will give you the most value for your money. Using a payroll software, some business owners have reported completing their payroll in minutes while avoiding common mistakes and pitfalls associated with manual processing. Many accountants have also reported that they were able to automate a wide variety of repetitive time consuming tasks such as tracking accounts payable and accounts receivable through automated payroll processing capabilities built in a payroll software. Because you can save both time and money, many experts and business advisers recommend that you purchase payroll software while your business is just starting out, even if you just have one employee. It is a proven fact that a new small business that uses a payroll software which handles all the basics is prepared for the future growth when the time comes that the company expands, hires more employees, and managing its workforce becomes more complex. By having a access to a payroll software, you can simplify and automate the process of paying your employees which can become complex and prone to errors if you try to do it manually. From computing deductions and employee benefits to producing payslips and filing employment taxes, online payroll processing services will allow you to reduce cycle times while ensuring calculation accuracy. The good news is that nowadays payroll software or payroll processing services can be acquired or subscribed online as there are various SaaS platforms and cloud hosted platforms available at affordable monthly fee. 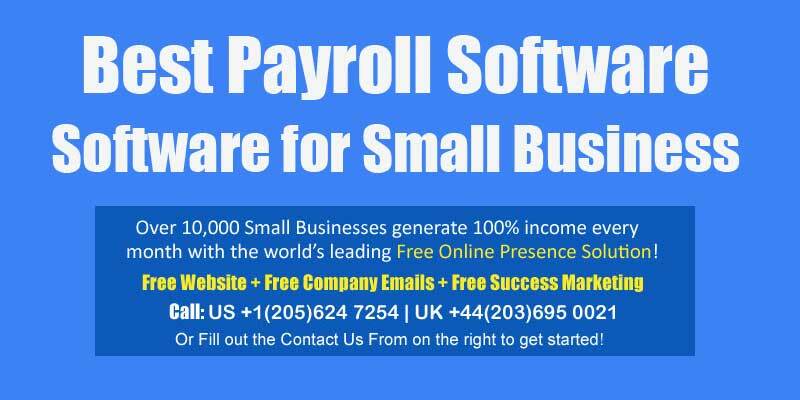 Some payroll software for small business are even offered free to get started which can handle basic payroll functions. If you are one of those companies that prefer to outsource the payroll processing to third-party providers while others with dedicated HR or accounting departments do it in-house then payroll software can be asset for your company. With the advancement in technology, Payroll software can now be installed on-premise, or availed online by subscribing on a monthly basis. They are often included as modules or part of the features of an integrated accounting solution, HR software suite, or an enterprise resource planning (ERP) package. One of the main benefits of using payroll management software is secure financial transactions, efficient handling of employee data, and getting detailed reports on staff payroll. If you have been using Quickbooks online from Intuit then you can also opt for its Full Service Payroll. The software is built keeping in mind simplicity for payroll management, allowing accountants and business owners to make payrolls efficiently and accurately, automating tax calculations, and even generating unlimited paychecks. It is a cloud based accounting and payroll processing application that brings together payroll, benefits administration, HR and compliance functionalities in a single, simplified package. It is built for small businesses that are looking to manage their core HR needs. Moreover, it provides users with a solid set of payroll features, well-designed user interface, and automation capabilities, which is why it landed the top spot on our list. It is a popular accounting software by UK based Sage Group. While primarily designed for handling financial management processes such as cash flow monitoring and invoicing, this platform also offers robust add-ons for payroll management and tax preparation. The features that Sage50 CLOUD offers, you can automatically compute income tax returns, file your reports online and directly send your employees’ pay using the software, making the entire process faster, more convenient and efficient. HMRC-recognised software, ideal for business owners and office managers who need to manage payroll for up to 15 employees. It is among the most popular web-based HR management system from Automatic Data Processing, a provider of HR management software and services. It is built for small to mid-sized companies, this platform combines all of the HR functionalities you need in a single suite. It allows you to easily manage employee payroll, time and attendance, and benefits without having to rely on multiple software solutions. Everything you need to get payroll right. Pay on time, avoid errors. Accurate pay, deductions and tax filings. Online reporting and analytics. Built-in alerts and calculations. Regulatory and compliance support for peace of mind. Insights pushed to executives and managers through mobile — plus employee access to pay stubs and Forms W-2, time and attendance, and more. Mobile clocking with geo-fencing, and work schedules and time off that synch with Microsoft Outlook® Calendar. Manage by exception, and closely monitor attendance, absences and productivity. Automate rules, time calculations, alerts, audits and reporting. Manage leave cases and attendance policies. Proactively monitor overtime and hours, correct and approve time cards and expedite payroll processing. It has won several awards and it is also cloud-based accounting software used by companies worldwide. The only disadvantage of this software is that its payroll feature is only available for US and Australia. Designed for small and medium-sized businesses, it comes with enterprise-grade functionalities that handle invoicing, inventory management, bank reconciliation, and expense management for multiple currencies. Aside from that, the platform is also known for its advanced payroll features that allow users to sync their employee productivity data, automate payroll computations, as well as prepare income tax returns. Automated payroll filings, W-2s, 1099s, unlimited payrolls and direct deposit come standard with all Gusto plans. Xero’s customers can easily process payroll through Gusto as it comes integrated with Xero accounting. Easy navigation between platforms, single sign-on, and Gusto payroll transactions to sync seamlessly as Xero Bills. There are so many payroll software for small business on the market but you should not only consider pricing when deciding because you may have unique business needs that a cheap product cannot fulfill. Instead you should choose a platform that can handle your unique processes and scale up to the changing needs of your growing business. One of the most important thing to look for when choosing a Payroll software is the vendor. A good vendor always creates payroll software products that comply with the federal and local taxation regulations that keep evolving. Going through the above mentioned points, finding the best payroll software for your small business isn’t complicated. All you have to do is go through the post thoroughly and follow the points mentioned in it.